Steven Naismith believes he is capable of playing effectively as Scotland's lone striker in the vital Euro 2016 qualifier against Poland in October. The Everton forward hit at hat-trick in the 3-1 win over Chelsea on Saturday. Sunderland's Steven Fletcher, who has not scored since 8 August, started up front for Scotland in defeats by Georgia and Germany. 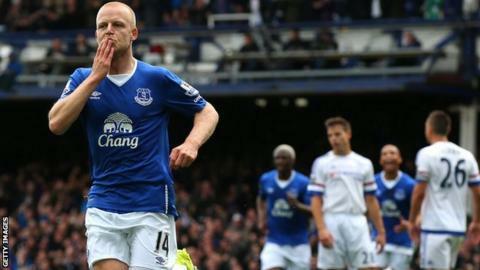 "It's a role I've played before but it's the manager's call," Naismith told BBC Radio Scotland's Sportsound. "We've got a lot of good forward players who will all fancy their chances for the next couple of games next month. A lot of it will be determined by how they're doing at their clubs from now until then. "It's a funny one. I probably come under the category of a forward player that can play in many of the positions. "When I've spoken to managers over the years about where to play, they've said for forwards it's good that they can move around. "I'm much the same, I feel for a period of time last season I played at number 10 quite a lot, then after period of time I moved out to the left and it was a nice wee change for me. "It was a wee bit different from what had been the norm. Having that freedom definitely helps me because I'm that type of player that wants to pick up the ball." Scotland are currently fourth in Group D on 11 points, four points behind third-placed Republic of Ireland with six points left to play for. Gordon Strachan's men are at home to Poland on 8 October, then away to Gibraltar on 11 October. Martin O'Neill's Irish side have Germany at home then Poland away. Naismith, 29, has scored five times in 39 appearances for his country and admits Scotland probably showed Georgia too much respect in the 1-0 defeat. "That's probably the first result we've let ourselves down with," he said. "It's crazy how one result in the group turns the mentality of everyone around, but we know what we've got to do against Poland and we'll take a lot of positives from how we played out in Poland last year. "The group can swing so many different ways that we've got to just do our bit."